Containing the world’s largest collection of contemporary ecclesiastical art, the National Shrine’s Byzantine-Romanesque architecture is home to an unfathomable amount of mosaic artistry. Distributed throughout over 80 chapels and oratories, and in the domes of the Great Upper Church, the current calculation of the mosaic interior of the Basilica is 75,545 sq. ft. With the completion of the Trinity Dome mosaic, this number will increase by 18,300 square feet. Lending credence to the sheer volume of the mosaic artistry is the Christ in Majesty mosaic, which dominates the North Apse of the Great Upper Church. It is one of the largest mosaic images of Jesus Christ in the world, containing more than 4000 shades and colors. The National Shrine’s reason for using this art form is one of historical and symbolic proportions. Mosaics date back to the 3rd millennium BC and the earliest known artifacts were found at a temple building in Abra, Mesopotamia. However, these mosaics are far different than those of today. Instead of forming patterns and images, mosaics were merely millions of abstract pieces of tesserae used to create floors and paths. Fast-forward to the era of imperial Rome, mosaics became less abstract and more of a form of artistic expression, portraying patterns and sometimes even mythology and historical events. They were still used mainly as a form of flooring, although excavations in recent years have revealed that there are a few late Roman buildings whose walls were encrusted with mosaic designs. Ultimately, this changed when Roman Emperor Constantine adopted Christianity and moved his capital from Rome to Constantinople, in turn affecting the rise of the Byzantine Empire. Christianity flourished and took root in the Byzantine regions under Roman rule, dramatically impacting the way that art was seen and created. Art started to be seen as a means of sharing Christian messages in physical and decorative form, and during this period churches changed from bare structures to artistic masterpieces. Taking the mosaic concept from the Romans, the Byzantines expanded on the idea, using the tesserae to decorate not just the floors, but the walls and ceilings as well. Over time, mosaics became associated with religious art, becoming a staple art form for religious depictions. Why Mosaics for the National Shrine? The concept of the mosaic fits perfectly into the Byzantine-Romanesque structure of the Basilica. The Romanesque form is represented in the figurative sculpting as shown in the full size figures of saints, the finely sculpted tympana and archways, the various niches in the nave and chancel areas, and the stained and faceted glass windows in both the Upper and Lower Church. The Byzantine form is represented through the remarkable use of mosaic and marble as shown in the mosaic ornamentation of the seven main domes, the walls and ceilings of the many side chapels and oratories, and the beautiful marble claddings. The Basilica of the National Shrine of the Immaculate Conception is the only church where these two art forms have unique artistic expression in concert with each other. 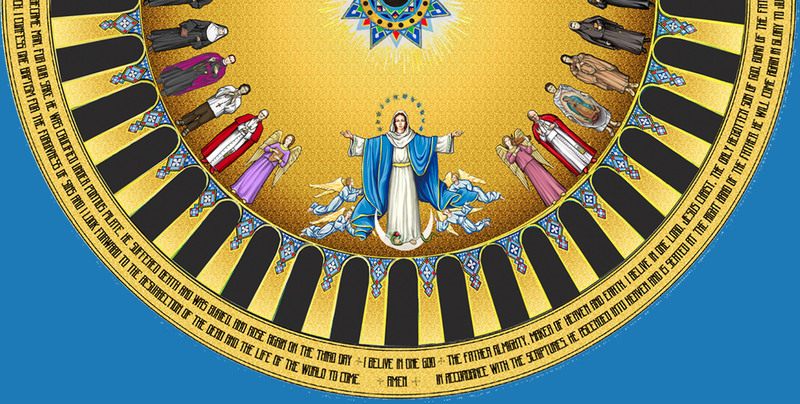 But more importantly, like the Trinity Dome, the mosaics are a physical manifestation of the universality and unity of the Catholic faith, and, more specifically, America’s Catholic Church. Each individual piece of tesserae, although vastly different in shape, size and color from any other piece, comes together to form a cohesive, beautiful image. In the same way, Catholics from different nationalities and backgrounds come together to form the body of clergy.